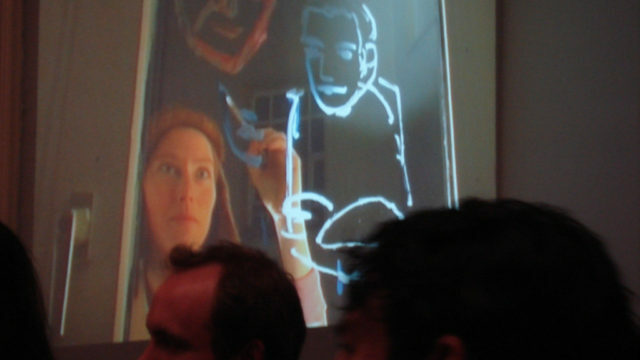 Portraying the audience in the theatre installation as seen through a window from the outside. With Ana Suarez, Andrea Pani, Ariane Vitale, Irene Selka, Kathleen Kunath, Micha Laages, Simone Donha, Stephanie Hanna und Thomas Weppel, direction: Zé de Paiva. Spontaneous improvisations with invited visitors in shifting constellations of plastic packaging in a department store window. Collaborative video performance created during the two-week performance residency Con|Verge at Ponderosa Tanzland with the House of Ia (KB Thomason und Jillayne Hunter) and CJ Holm. while you are running with the clock? and playback of morning routines. Two performers repeat this scene after each other. Site specific sound and movement improvisations with singers, movers and musicians Andreas Monning, Arne Freymann, Birgitta von Homeyer, Christine Kahlau, Cris Arruda, Henriette Schulz-Molon, Jenny Grunow, Julia Boor, Martin Braun, Nadja Haas, Ruth Grünbaum, Sanaz Rassuli, me and many others. Until October 2011 in the globe of the former radar station of US and GB secret services on top of Teufelsberg, and in November and December 2011 in the former department store window Donau Ecke Ganghofer and at Stattbad Wedding. Writing an excerpt of Walter Benjamins´ memoires of his childhood in Berlin on a window, in reverce writing, from the inside while the audience is outside. Ending the performance, I dilute and erase the writing by spraying water on it.